2017 marks five hundred years since Martin Luther (supposedly) nailed his famous theses to the church door in Wittenberg and so set off the set of conflicts and changes in the European Church that we now call the Reformation. In 1517 Durham was still a monastery. Luther’s writings first really reached England in 1519, in advance of his excommunication the following year. Henry VIII was to write his “Defence of the Seven Sacraments” in 1521. Durham sadly does not have a copy of this from the sixteenth century that I have found- it would be fascinating to see what the monks made of Henry’s response to Luther’s theology. They probably would have approved of the Defence, even as they might have suggested other possible arguments in the margins, supported by quotations from the Bible. Martin Luther in 1529, by the workshop of Lucas Cronach the Elder. The first of the anti-Lutheran tracts in the Durham collection is Johan Dietenberger’s “Contra Temerarium Martini Luteri” (Against the Recklessness of Martin Luther) from 1524. For the next twenty years, Durham monks were to take an interest in the theological developments in Germany, writing commentary in the margins of books on the situation of the Church. Spoiler alert: monks such as Thomas Swalwell absolutely hated Luther’s ideas. There are lots of comments in the Durham printed books about how Peter was the foundation of the Catholic Church and the popes were heirs of Peter and thus had authority over Christendom. ‘On this rock will I build my Church’ (what Christ said to Peter in Matthew 16:18 playing on the Greek meaning of ‘petros’ as rock) was frequently quoted in margins. Bishop Tunstall’s chaplains also really did not like Luther and his theology. Walter Preston, who died in 1533 so never had to face the choices of the English Reformation, annotated his 1514 copy of Jean Gerson’s works with lots of comments on Lutheran follies, including comments on the appropriate powers of the church and why celibacy for priests was a good idea. He also was quite concerned with heresy, and probably saw Luther as fitting into Gerson’s fourteenth century understandings of heretics. Gerson had been a prominent theologian of the fourteenth century and an active advocate for Church reform. Luther clearly didn’t measure up, in Preston’s view! Preston was much more impressed with the ideas of people like Erasmus and their calls for some sort of reform with the Catholic Church. Lutheran ideas did eventually come to Durham in the late sixteenth century. There’s a fun collection of sermons and other liturgical texts, “A Postill or Exposition of the Gospels“, printed in London in 1577. It says that ‘God hath raysed up Luther who (as our Orpheus of Germanie) hath comprised in Dutch verse the summe of Christian Doctrine’. It belonged to the parish of Redmarshall in the 1580s, probably when the wonderfully named Marmaduke Blakiston was rector. Blakiston was a young man then, and only become a canon at Durham in 1599. He probably brought the book to the Cathedral with him. 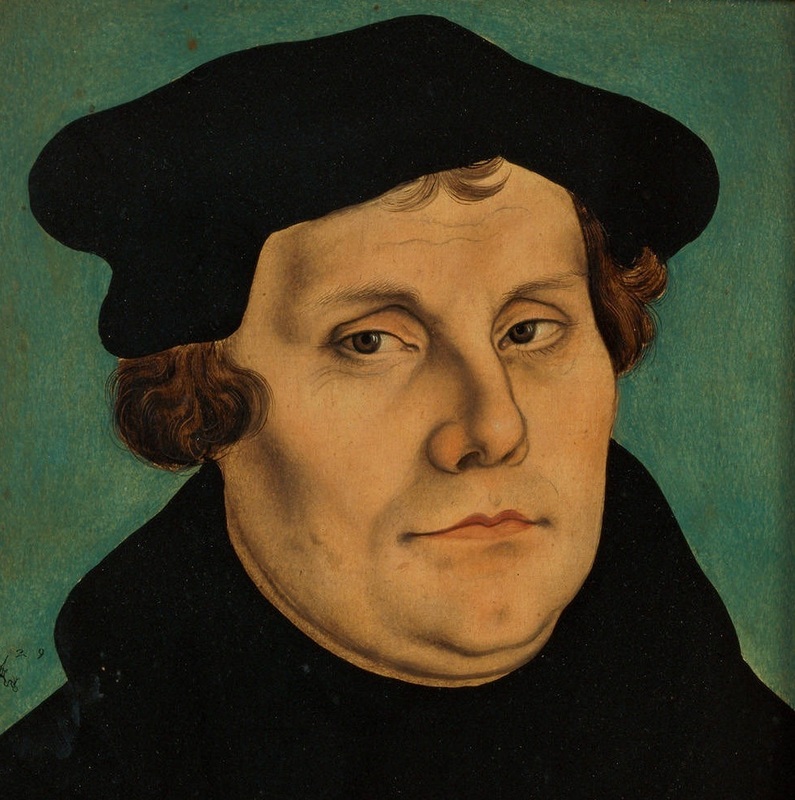 In the 1580s, he might have purchased the sermon collection to instruct his parishioners in Lutheran ideas. The monks and Walter Preston would have been horrified. Preston might at least have liked that someone in 1585 added a note to pray for the soul of Preston’s boss, Cuthbert Tunstall, to the flyleaf. Luther at Durham shows us a little of the changing religious landscape of the north of England from suspicion of Protestant ideas before around 1550 and then the possibility of using Lutheran ideas in a parochial context in the later sixteenth century. Of course, this was all heavily contested. In the 1520s, Preston had been among those involved in trying people interested in Luther as heretics. Equally in the 1570s and 1570s there was a long-running controversy over the dean of Durham, William Whittingham and his evangelical views and connections to John Calvin and the Geneva Church. That’s a story for another time.